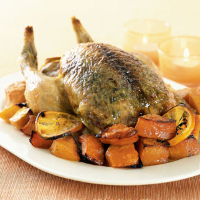 Roasting chicken with a fresh herb, garlic and lemon butter under the skin keeps the meat tender, while the squash beneath absorbs all the wonderful juices. Preheat the oven to 190°C, gas mark 5. In a bowl, beat the butter to soften it slightly, then stir in the herbs and grated zest of 1 of the lemons. Mix well and season with black pepper. Make a pocket by lifting the skin away from the flesh of the chicken breast and sliding your fingers underneath, loosening to the top of the legs. Using a spoon or your fingers, carefully push the butter under the skin so that it sits on top of the breast meat. Pat the skin down. Place the butternut squash in a large roasting tin and season with black pepper. Slice the second lemon and add to the tin. Place the chicken on a metal rack over the squash. Halve the zested lemon and squeeze the juice of one half over the chicken. Place the remaining half in the cavity. Place in the oven and cook for 45 minutes per kg plus an extra 20 minutes. Check the chicken is cooked by inserting a skewer into the thickest part of the thigh - it is ready when the juices run clear and there is no pink meat. Remove the rack once during cooking to turn the squash. Transfer the chicken to a warmed serving dish, cover with foil and rest for 10 minutes before carving. Keep the butternut squash warm by covering with foil and placing in the oven on a low heat. Reserve the cooking juices and use to make a gravy together with any cooking water from accompanying vegetables. Serve the chicken with the butternut squash and some green vegetables. The best and safest way to prepare butternut squash is to peel, using a sharp Y-shaped peeler. Then halve, deseed and cut into chunks. This herb-filled dish needs a full-bodied, rich but delicately aromatic New World Pinot Gris, such as Villa Maria Private Bin Pinot Gris, East Coast, New Zealand.